An exciting day for species conservation, the 12th annual Endangered Species Day is today, May 19, This day provides an opportunity for people to learn everyday actions they can take to help protect our nation's endangered species. Today will facilitate recognition of the extensive efforts currently in place to protect our nation's endangered and threatened species and their habitats. Spearheaded by the National Wildlife Federation, Endangered Species Day was established in 2006 after the United States Senate unanimously passed a resolution designating a day to encourage the public to become educated about, and aware of, the current threats to species and the success stories in species recovery. Plants and animals near extinction were first provided security in the Endangered Species Act, signed into law by Congress in 1973. In a conservation win, only 9 out of 1,800 species listed as endangered were declared extinct since the implementation of the Act. Having paved the road for the Endangered Species Day, the Act declared the importance of protecting endangered species and containing extinction prevention for hundreds of species, including the bald eagle, grizzly bear and the Florida panther. 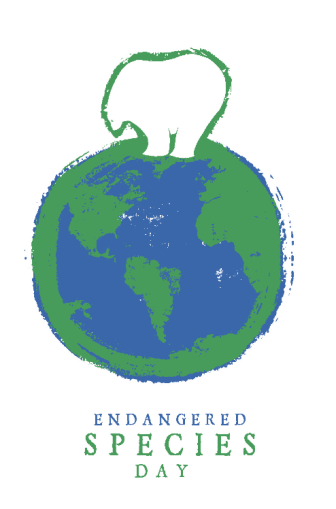 Now Endangered Species Day is recognized across the nation and in events at schools, libraries, museums, zoos, aquariums, botanical gardens, businesses and community groups alike. It also provides the opportunity for promoting all worldwide species conservation efforts. This Saturday, May 20, join the Michigan Nature Association for its third annual Karner Blue Butterfly Family Fun Run & 5K at Millennium Park in Grand Rapids, as part of the Race for Michigan Nature, a statewide series of Family Fun Runs & 5Ks stretching from Belle Isle in Detroit to Marquette in the U.P. Each race spotlights one of Michigan's rarest species and helps promote the importance of protecting Michigan's remaining natural areas. This event will help raise awareness for endangered species and habitat conservation efforts. Sign up at https://runsignup.com/Race/MI/Walker/KarnerBlueButterflyRun.